Enrique Pena Nieto, 46, began his as Mexican president on Saturday. He leads the Institutional Revolutionary Party, or PRI, which has governed Mexico from 1929 continuously (71 years) until it lost power for two terms (12 years)in 2000 to Vicente Fox of the conservative Partido Acción Nacional (PAN), then Nieto's predecessor, Felipe Calderon under the same party banner. Reuter's captures much of the situation in Mexico with this observation, "Telegenic and married to a popular actress, Pena Nieto promises to restore calm after more than 60,000 people were killed in violence between drug gangs and security forces during the six-year term of his conservative predecessor." Nieto's family. Nieto's first wife died in 2007 leaving him with three children. He remarried in 2010 to an actress Angélica Rivera. The reports are that there are six children in all - presumably some are Rivera's - in a blended family. The violent drug wars have seen the electorate casting for some leader who would be able to gain effective control of the country - both Fox and Calderon did not, now it is back to the PRI leader to have a go at it. From Wikipedia, we read, "Mexico is a major transit and drug-producing nation: an estimated 90% of the cocaine smuggled into the United States every year moves through Mexico. Fueled by the increasing demand for drugs in the United States, the country has become a major supplier of heroin, producer and distributor of ecstasy, and the largest foreign supplier of marijuana and methamphetamine to the U.S.'s market. Major drug syndicates control the majority of drug trafficking in the country, and Mexico is a significant money-laundering center. After the Federal Assault Weapons Ban expired in September, 2004 in the United States, the Mexican President Calderon decided to use brute force to combat some drug lords and in 2007 started a major escalation on the Mexican Drug War. Mexican drug lords found it easy to buy assault weapons in the United States. The result is that drug cartels have now both more gun power, and more manpower due to the high unemployment in Mexico. Drug cultivation has increased too." Mexico's security forces battle well-armed drug cartels, along with maintaining integrity within their own organizations which are constantly being infiltrated by cartels with ready cash and bribes. Being neighbor to a lone world superpower is not easy - US domestic and international foreign policies weigh in heavily on how Mexico fares economically and politically. Along with the drug-fueled blood letting, illegal immigration will be an issue that re-elected US President Obama, and newly elected Nieto will tackle. In January 1994, Mexico became a full member of the North American Free Trade Agreement (NAFTA), joining the United States and Canada. Trade with the United States and Canada has tripled since the implementation of NAFTA. As a result, Mexico has a free market economy that recently entered the trillion-dollar class. It contains a mixture of modern and outmoded industry and agriculture, increasingly dominated by the private sector. Recent administrations have expanded competition in sea ports, railroads, telecommunications, electricity generation, natural gas distribution, and airports. However, per capita income is one-quarter that of the United States and income distribution remains highly unequal. The border is a challenge for drug running, illegal immigration, and economic trade. From a CNN article, we read, "Mexico, one of the largest suppliers of oil to the United States, has a big problem: Its production of crude is falling fast. In 2008, the country's production peaked at 3.2 million barrels a day, according to the U.S. Energy Information Administration. Last year, it didn't even produce 3 million a day. The reason: aging oil fields and years of underinvestment. Industry experts say Mexico could revive production if it allowed more investment from international oil companies. But under current policy, EIA says Mexico will have to start importing oil by 2020. For the United States, the decline in Mexico's oil industry means it will likely be buying more oil from Canada and Saudi Arabia, the No. 1 and No. 2 sources of U.S. oil imports. Mexico is now third." 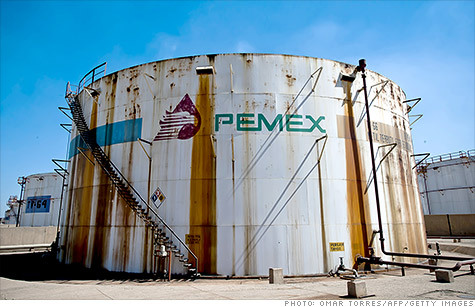 Mexico faces declining oil production rates as its fields age and the state oil company, PEMEX, still has a monopoly on the business - but one in which reinvestment has not been maintained at sufficient levels. Mexico has a population of over 112 million, nearly 4 times that of Canada. A few days before President-elect Nieto's swearing in, he met with re-elected US President Obama. Let's hope that wise leadership on both sides of the porous border will prevail. Canada, the other major US neighbor, has long maintained peaceful and prosperous relations, and much is to be gained by the same by Mexico.